I am passionate about conservation of Caribbean birds and their habitats, especially seabirds. 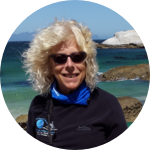 I have been surveying colonies and working to promote seabird conservation for more than 35 years. Since studying Sooty Terns and Brown Noddies at the Morant Cays, Jamaica for my PhD at University of the West Indies, I have continued to monitor Jamaican seabird colonies. As co-chair of the BirdsCaribbean Seabird Working Group, I promote awareness of the need for conservation of seabirds and encourage others to get involved in seabird monitoring. I am specially interested in developing cost-effective long-term monitoring programs for birds and their habitats, including banding. In 2014, I was the lead author of a BirdsCaribbean manual for surveying Caribbean seabirds. I am also the lead author for a field guide to Jamaican birds "A photographic guide to the birds of Jamaica" published by Princeton University Press in 2009.